Vocal music connects with listeners through lyrics, melodies, and arrangements. Instrumental improvisation is rare and usually serves as a device for building the energy of the song. The mystery of a magical pop or rock tune lies in the mix of lyric, melody, and presentation. Jazz on the other hand is about virtuosic instrumental performers composing in realtime without a net. The soloist’s ability to spontaneously create, usually on top of complex, rapidly moving harmonies can take the audience on a powerful and unexpected emotional journey. This stripped-down, solo-driven intensity can lend a static quality, a kind of esoteric minimalism to what many people think of as “jazz”. Just as jazz harmonies and styles have evolved over the years, restless jazz musicians have explored new approaches to making their music, mixing improvisation, ensemble writing, and genres not usually associated with jazz. For me, this pursuit of innovation has always been key. I love music that balances the direct emotion of pop and roots styles with the freedom and sophistication of contemporary improvisational techniques. 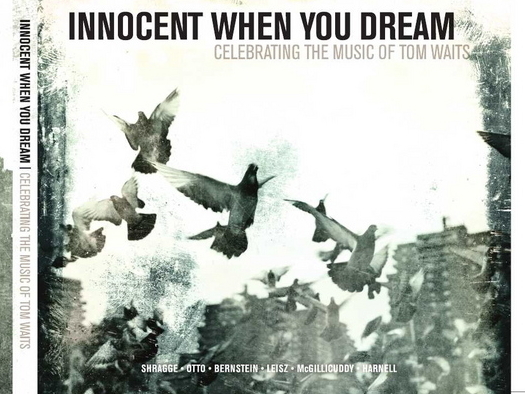 I was very excited to hear Brandon Bernstein’s new CD, “Innocent When You Dream – Celebrating The Music of Tom Waits” . The band, Brandon Bernstein (guitar), Aaron Shragge (trumpet, shakuhachi), Matt Otto (tenor sax), Greg Leisz (pedal steel and dobro), Ryan McGillicuddy (bass), and Jason Harnell (drums) take an ensemble approach to the material. The group’s sound is wide open but still deeply connected to the core of each of these songs. While there are solos throughout, this is not a blowing date, but a conceptual work, merging the skills and personalities of these fine musicians with the unique songwriting of Tom Waits. Choosing Tom Waits as the starting point for this music is quite ambitious. Waits is a multi-faceted, iconoclastic artist, from his powerful voice (and Radio Shack bullhorn), to his theatrical song-cycles, dramatic arrangements, physical presence and deeply emotional songwriting. Rather than trying to capture the ‘Big In Japan’ totality of Waits, the band has taken an approach similar to the traditional jazz read on Tin Pan Alley tunes. Some of the tracks are true to the tone of the Waits originals and others use his version as a springboard for something fresh and unique to this band. The album, opens with ‘Good Old World’ originally done as a waltz. Matt Otto has arranged the song in a somewhat brighter 4/4 meter, opening up new possibilities. Brandon Bernstein and Otto contribute thoughtful, melodic solos, and Greg Leisz adds a touch of mystery and a hint of Robert’s Western World. The arrangement teases the listener, playing with new directions, but staying close to the introspective emotion of Waits’ original. Jason Harnell’s fills are free and colorful, letting us know that the band is listening and ready to let the music go where it will. The opener tells us that these musicians are quite comfortable exploring this unique mix of musical styles. Aaron Schragge’s modal arrangement of “Blue Valentines” drops the slight tongue-in-cheek, noir jazz vibe of the original, favoring the bones of the song itself. The band treats it as a pensive jazz ballad with introspective solos by Schragge and Otto over Brandon Bernstein’s hypnotic chordal vamp. Jason Harnell’s out-of-time fills add color and dynamics, pushing and pulling the mood. 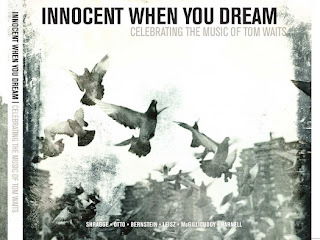 The title track, “Innocent When You Dream”, arranged by Brandon Bernstein, artfully mixes the melancholic melody (Schragge and Otto) with pedal steel guitar, creating a blend of country longing, and “last dance of the night” bar room glow. Harnell paints fills and colors on the canvas of the song. It works. “Flash Pan Hunter” always reminds me of some sort of demented Max Fleischer cartoon. William Burroughs’ lyrics conjure up images of grainy, distorted, psychopathic, vegetation and mechanical contraptions going about their daily business. Schragge’s treatment takes a different look at the song, bypassing the wackiness and playing the tune as a rubato ballad with a long free introduction. Schragge plays shakahachi flute on this track which clearly sets the tone for the arrangement. Berstein’s straight forward arrangement of “The Long Way Home” features Greg Leisz and almost hints at a Caribbean feel. Cowboy jazz with a light touch. The record also features performances of “Picture In a Frame”, Frank’s Theme”, “Can’t Wait To Get Off Of Work”, and two original group improvisations, “Orphan” and “Fishbone”. You can catch the band (with Doug Livingston substituting for Greg Leisz) performing a free CD release concert at 7:30, Saturday May 1 at the Pasadena Presbyterian Church, 585 E. Colorado Boulevard in Pasadena, CA. You can find this music in the iTunes Store, at Amazon.com and at CD Baby. You can also purchase CDs by contacting Brandon Bernstein through his website.